Only 2 percent of Americans who voted for Trump regret it. President Donald Trump makes his way to board Marine One on the South Lawn of the White House in Washington, D.C, on Feb. 24. President Donald Trump is getting ready to mark his 100 days in office as the least popular commander in chief of the modern era at this point in their presidency. But among his supporters, 96 percent of those who voted for Trump said they would do it all over again if the election were held today, and only 2 percent say they regret supporting him, according to the latest Washington Post/ABC News poll. In contrast, 85 percent of Americans who voted for Hillary Clinton said they’d vote for her if the election were held today. That’s not because Clinton voters would support Trump, but rather because they say they’d be more willing to back a third-party candidate or not vote at all. The poll makes clear what numerous surveys have already pointed out: Trump has not enjoyed the typical 100-day honeymoon period. Overall, only 42 percent of Americans approve of Trump’s performance as president, and 53 percent disapprove. The number is worse in the latest NBC News/Wall Street Journal poll that puts Trump’s overall job-approval rating at 40 percent, 4 points lower than it was in February. That is in sharp contrast to the average 69 percent approval for past presidents at or near the 100-day mark. President Barack Obama, for example, had a 69-26 percent approval rating near his 100 days in office. More than half of Americans don’t think Trump has accomplished much in his first 100 days. Forty-five percent of Americans flat out say that Trump’s presidency is off to a poor start while 19 percent say it’s been “only a fair start.” That compares to the 35 percent who say the president’s first 100 days have been “good” or “great,” according to the NBC/WSJ poll. That doesn’t mean it’s all doom and gloom for the president. The Post/ABC poll also finds some surprisingly positive evaluations of the commander in chief’s performance on certain issues. More than half of Americans—53 percent—say Trump is a strong leader, including 25 percent of Democrats. Plus 73 percent of Americans approve of the way he has been pressuring companies to keep jobs in the country. A plurality—46 percent—also approve of the way he has been handling North Korea. The president also gets high marks for his recent military actions in Syria, which 62 percent of Americans say they support, according to the NBC/WSJ poll. 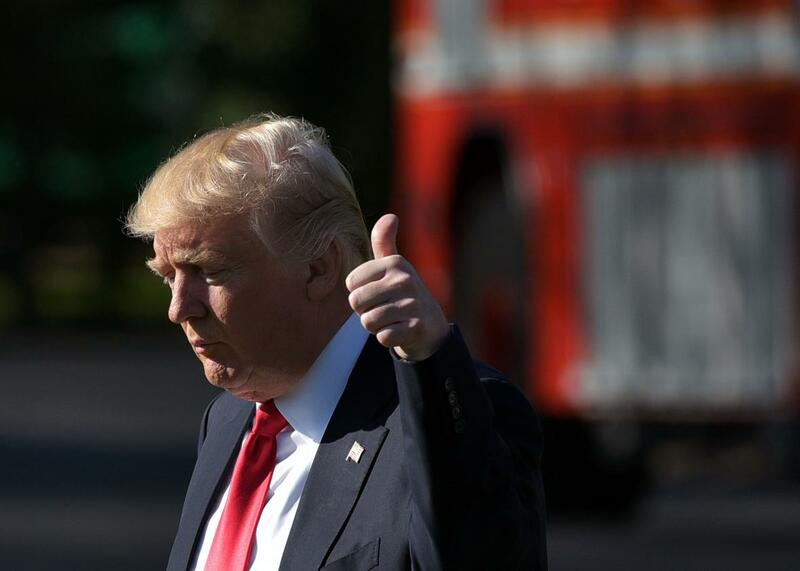 Still, despite these few bright spots, the polls point to mostly bad news for the president, as 56 percent say he doesn’t have the judgment to serve effectively as president, and 58 percent doubt his honesty and trustworthiness. The public also seems to have noticed Trump’s penchant for changing his mind, with 55 percent saying he doesn’t follow a consistent set of principles. Democrats should be cautious about getting too gleeful about Trump’s numbers though, as 67 percent say the Democratic Party is out of touch with the concerns of most Americans, according to the Post/ABC survey. Both Trump and the Republican Party have better scores in that regard with 58 percent and 62 percent, respectively. *This post has been updated to include additional information from the Washington Post/ABC News poll.